your nostrils and throat with luke warm saline water. The jalneti kriya is very easy and very useful for life. A special type of water pot like small tea cattle is used for jalneti kriya. The luke warm hygienic saline water is sucked by one of the nostril and is expelled from the other nostril and the mouth simultaneously. A continuous flow of water in the nostrils is reversed, after half of the process. After the neti expel forcefully all the remaining water inside the nostrils. 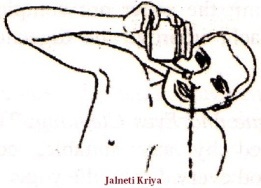 A few drops of pure ghee or olive oil or coconut oil may be put in the nostrils at the end. Benefits : Its clean nostrils and the breathing becomes regular and deep. It is a sure cure for all type of colds bronchitis and asthma without any medicine. This entry was posted in Smart astro guru, Yoga & Kundalini Shakti and tagged Benefits of jalneti kriya, Jal neti, Jal neti kriya, Jalneti, Jalneti kriya by R. N. Sharma. Bookmark the permalink. This video post is actually impressive, the noise feature and the picture feature of this tape post is truly remarkable.